I am so happy that more modern comedies are trying to be like “Hot Fuzz,” and have a funny screenplay to go with the great jokes. One where the jokes are not just one-liners, but serve as plot points that add a whole new layer to the film and its characters. They’re not just funny for their own sake, but also smart. “Horrible Bosses” did this wonderfully, and now we have those writers returning to direct another witty, multi-layered comedy-thriller, “Game Night.” Whether you’re going into this one for the action and intrigue or for the laughs, there’s enough of both to go around, especially since it’s filled to the brim with charming characters and twists that keep the audience on their toes. It makes this film feel refreshing, especially since 2017 didn’t have many worthwhile comedies. The film follows married couple Max and Annie (Jason Bateman and Rachel McAdams), two extremely competitive people who love to play any sort of game – board game, video game, trivia, you name it and they’re convinced they can beat you at it, except for Max’s vastly more successful and accomplished brother Brooks (Kyle Chandler). The couple have a weekly game night with their group of friends and invite Brooks to join them while he’s in town. Brooks then insists on having the next game night at his place, where he promises to take it to the next level, where things get far more real than Max and Annie ever thought possible. The glue that holds “Game Night” together is the charming and lovable relationship between Max and Annie. Since both of them are very competitive, you’d think they would spend their time fighting each other to see who is better, but it quickly becomes the opposite of that – they become a team that practically shares one mind and do their best to make the other even better. They spend their wedding night playing “Dance Dance Revolution” with the biggest smiles on their faces. They each bring far more meaning into the others’ game of life, and they never lose sight of that. My favorite scene involving these two comes early on when Max admits why he’s so jealous of his brother. While Annie doesn’t initially see it, after spending the evening around Brooks, she completely understands why Max feels this way and hates Brooks just as much. In any other movie, the spouse would never understand why the other is so jealous or upset until the final act, like they don’t think it’s a big deal and the other should just get over it. But Annie supports and understands her husbands’ feelings, and instead of choosing to ignore them or tell Max to man up, she wants to help find a way to get back at Brooks and make him feel like the inadequate one. That was the moment that I truly fell in love with these characters. 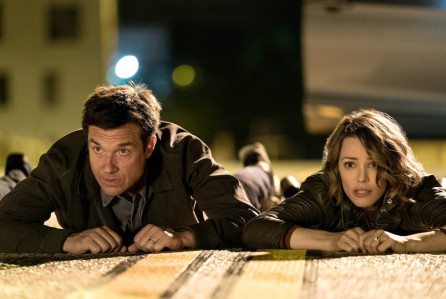 “Game Night” also has a varied sense of humor, ranging from slapstick and witty dialogue to callbacks and jokes with a long wind-up. It also has a very violent sense of humor at times, upping the ante from “Horrible Bosses” and giving us some scenes that’ll make you squirm in your seat. But it never goes too far in one direction as it masterfully pulls off a darker sense of humor that feels unique. To top that off, the mystery and intrigue in “Game Night” really does keep you on your toes. I was never too sure what was real or part of the “game” motif that is always persistent throughout the film. The cinematography really compliments this by having several scenes that portray our characters like pieces on a board game, each of them making progress throughout the board and having to deal with the obstacles along the way. 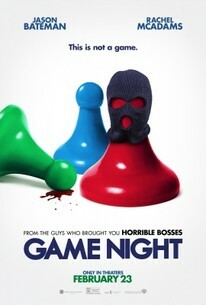 Overall, “Game Night” is a smart, funny and intriguing breath of fresh air. It offers a multi-layered black comedy filled with lovely and charming characters and a wide-range of comedy styles that never gets old. I’d recommend this film to everyone who enjoys a good R-rated comedy or who wants to see a good thriller with a great sense of humor. I wouldn’t mind if we start getting more comedies like this in future.